Jean-Mathieu Fallu, a student in the Ph.D. program, shared the best doctoral dissertation proposal award from the Association for Consumer Research (ACR) and The Sheth Foundation. The award will be presented at a ceremony held as part of the annual ACR symposium, on October 15, in St. Louis, Missouri. Jean-Mathieu’s thesis director is Professor Alain d'Astous, of the Department of Marketing. This is the second time that an HEC Montréal Ph.D. student has won this award. 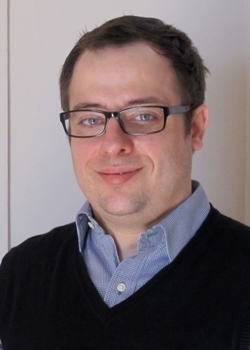 Jean-Mathieu’s dissertation is entitled L’adoption de comportements spontanés et de comportements délibérés de consommation socialement responsable : une perspective attitudinale. It attempts to explain the gap between the attitudes reported by consumers and their adoption of socially responsible consumer (SRC) behaviour. It makes an important distinction between implicit attitudes (impulsive evaluations) and explicit attitudes (reflective evaluations). It specifically suggests that despite a marked and sincere interest in socially responsible consumption, consumers do not spontaneously adopt such behaviour because their implicit attitude toward such behaviour is ambivalent. The main recommendation arising from his findings is that political players and organizations striving to encourage socially responsible consumption should first of all target consumers’ implicit attitude.